Rock Island Prison was located on the north side of the government-owned island in the Mississippi River between Davenport, IA and Rock Island / Moline Illinois. 12 acres of this swampy island were designated as a spot to build the prison. During Civil War times, it was known as Rock Island but today is referred to as Arsenal Island. The prison was built in mid 1863, and not yet completed in December 1863 when the first prisoners were incarcerated. 468 Confederate prisoners captured in battles at Chattanooga, Tennessee were the first to arrive, although, over 5000 total would swell the population of Rock Island Prison in that month alone. There were over 12,000 total prisoners imprisoned at Rock Island during the Civil War. Recorded deaths numbered almost 2000. Temperatures when prisoners began arriving in December 1863 were below 0 and sanitation was deplorable due to the overcrowding. Disease broke out swiftly, including a smallpox epidemic which killed hundreds of prisoners in the first few months of the prison's existence. Prisoners were buried next to the prison. In the spring of 1864, the bodies of dead prisoners were moved, a hospital built, and sewers installed. These measures improved health conditions tremendously and ended the smallpox epidemic. In June 1864, the government ordered rations to be cut at Rock Island, in response to the treatment of Union prisoners at Andersonville. Malnutrition and scurvy resulted from these orders contributing to the death toll of Confederate prisoners at Rock Island Prison. After the war, the prison was completely destroyed. What remains.....approximately 1950 Confederate soldiers interred under row upon row of pointed grave markers to tell the story of these valiant men who fought for the Confederacy. It has been reported, the reason the markers were created with points was to keep "Yankees" from sitting on them. There are two cemeteries located on Rock Island Arsenal. One is the National Cemetery and contains over 18,000 federal soldiers. The other is Rock Island Confederate Cemetery and contains almost 2000 Confederate soldiers who died at Rock Island Prison. Many have compared this Union prison with the Confederate's Andersonville equalling the two in horror and death. In reality, the death toll at Rock Island, though high was about 17 % of the total prisoners while more than 27% of the total prisoners incarcerated at Andersonville died. REVIEW: At times, the outdated prose gets a little difficult to wade through, but overall this is a fascinating account of life during this turbulent time in our history. Another reviewer mentioned "The Private Mary Chesnut: Unpublished Civil War Diaries", which seems to be Mrs. Chesnut's actual diaries kept during the war and offer a much more vivid picture. 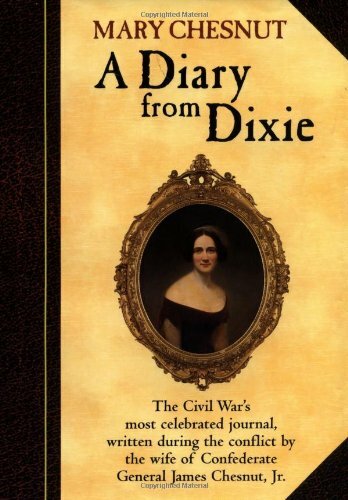 I wasn't aware that "Diary From Dixie" was a rewrite until now. I did enjoy it immensely (when I'd look up from reading it seemed odd that it was 1999 and not 1865!) and look forward to also reading the previously unpublished version.